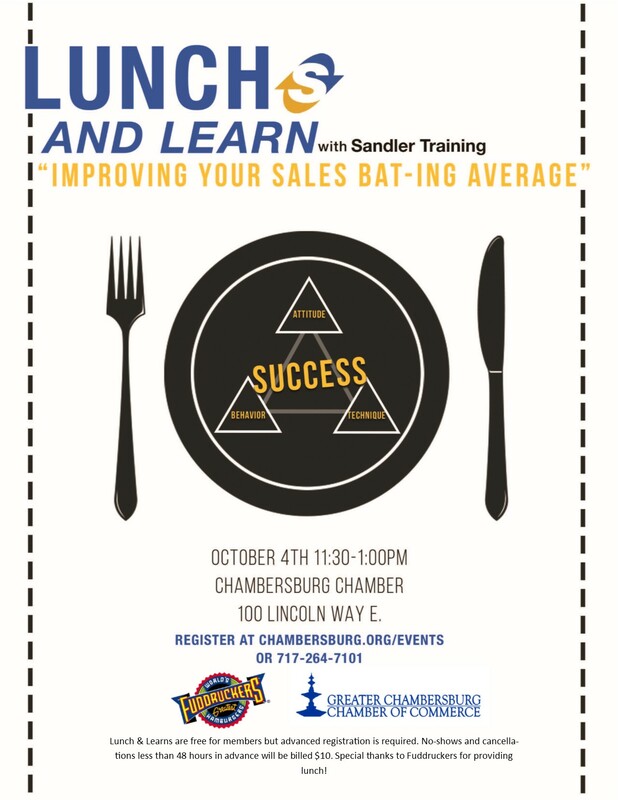 Join MaryBeth Staub from Sandler Training for this month’s Lunch & Learn: “Improving your Sales Batting Average” on October 4 at 11:30 a.m.
What are the behaviors, attitudes and techniques that you need to have in place to be successful in sales? Learn the key points around each of these areas and how you can make gradual and incremental changes to raise your overall sales batting average. Register now at Chambersburg.org/Events. Lunch & Learns are free for members but advanced registration is required. No-shows and cancellations less than 48 hours in advance will be billed $10. Special thanks to Fuddruckers for providing lunch!